Who doesn’t want a metaphorical peak under the hood of their Electric Vehicle (EV)? Leaf Spy, a smart phone app, talks to the computer in Nissan’s Leaf and displays the data it finds there—data essential to getting the most out of driving a Leaf. It’s a powerful tool every geek with a Leaf should have. What can Leaf Spy do? It can tell you exactly how much electricity is left in the Leaf’s traction batter. It can tell you the air pressure in your tires. It can unlock your doors—and much more. But it’s Leaf Spy’s ability to display the exact amount of electricity in the battery that’s it’s raison d'être. An EV runs on electricity not gasoline. To maximize the use of the Leaf, we need to know how much electricity is left in the “tank,” that is, the traction battery. This isn’t as straightforward as it sounds. The dash display’s two measurements that replicate the gas gauge in an internal-combustion vehicle: Nissan’s equivalent of a fuel gauge, and a State-of-Charge Meter. Like Toyota’s Prius, Nissan’s equivalent of a fuel gauge indicates the “fuel” remaining with illuminated bars. As the “fuel” is depleted the bars are extinguished. The remaining bars give an indication of the “fuel,” in this case, the electrical charge, remaining. The State-of-Charge (SOC) display reports the percentage of the charge remaining relative to a fully charged traction battery. Our Nissan Leaf has a 24 kWh traction battery under the floor of the passenger compartment. So far, so good. However, not all of the energy stored in the battery is available to drive the car. EV pioneers determined that early Leafs could draw on 21 kWh of electricity in the 24 kWh battery pack. New 2015 Leafs, such as ours, contain more than 22 kWh of usable capacity. As the traction battery ages, or as the temperature drops, fewer kWh are available to drive the car. Thus, the number of kWh available varies. That difference may not sound like much, but at the current state of mass-market EVs, every kWh counts. A loss of one kWh is equivalent to the loss of about 4 miles of range. That could mean the difference between getting to the next charge station or calling a tow truck. For example, with the advent of winter our Leaf has temporarily lost slightly more than two kWh, dropping from 22.2 kWh to 20.2 kWh of capacity in the space of a few months. That 10% loss of capacity is equivalent to a nearly 10 mile loss of range. We only know this because of Leaf Spy. When our car is fully charged, the State-of-Charge meter indicates 100%. But in winter this is 100% of 20 kWh not 100% of 22 kWh as it is in mid-summer. Therein lies the problem and the reason Leaf Spy is so valuable—it measures the actual amount of electricity available to drive the car. Leaf Spy reports the capacity of the traction battery in Gids, a unit named after Gary Giddings, the first person to penetrate the Nissan Leaf’s on board diagnostic system. Typically, there are 281 Gids of capacity in a fully charged car at standard temperature. New 2015 Nissan Leafs often contain 291 Gids. As temperature drops below standard temperature, so do the Gids available. This winter, Leaf Spy is reporting 260 Gids when our one-year old Leaf is fully charged, or about 20 kWh. At 4 miles per kWh that’s about 80 miles of range for our Leaf on a full charge. Leaf Spy uses an On-Board Diagnostic (OBD-II) device that communicates with the car’s computer by reading the Leaf’s CANBus. This is similar to the devices used by auto dealers when you take your car into the shop. Service technicians plug the device into the port on the car and read the car’s service codes. The trick has been determining what the digital codes mean. Only authorized Nissan technicians have access to the proprietary codes. Interpreting the information has taken time and a network of geeks keen on peering inside the Leaf’s computer. Developed by Jim Pollock, Leaf Spy incorporates what this network has learned and reports the data in a usable form readable on your smart phone. To my pleasant surprise, it even works on my BlackBerry Z10. 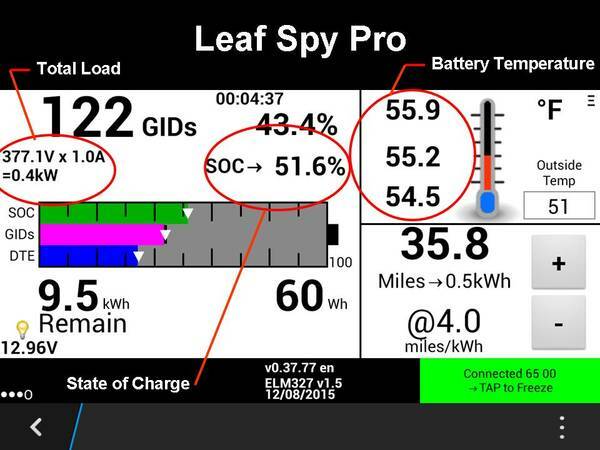 Pollock, Turbo3 on the mynissanleaf forum, monitors the Leaf Spy Pro discussion, providing insight on how his software works, what OBD devices work best, and what features might be added in future versions. He also provides a detailed help file on-line and in the software itself. For me, the $15 cost of the pro version of Leaf Spy was justified for one feature alone: turning off the Auto Door Lock. The Nissan Leaf has an annoying Auto Lock feature. When the car starts moving, the computer automatically locks all doors—whether you want it to or not. However, when you stop the car it doesn’t automatically unlock the doors. Of course, you can manually unlock the doors. At night this entails fumbling around for the switch in the dark. Or you could take the car into the dealer and have them disable this feature. In either case, the Auto Door Lock is a nuisance. Pollock’s app allows you to disable the Auto Door Lock, change the speed at which it occurs, or change how the feature works, for example, to automatically unlock all doors when you put the car into park. We chose to disable this feature entirely. You can also register tire positions so you can monitor tire pressure of individual tires after a service rotation. Leaf Spy registers the total load in kW as you drive and if you’re parked the total load from all the auxiliaries, such as from the headlights, ventilation fan, and the resistance heater. The Leaf has an 80 kW motor and as you push down on the accelerator, the dash displays a series of dots to the right of a neutral position, representing the amount of power you’re demanding from the battery. Leaf Spy gives you this number directly in kW. 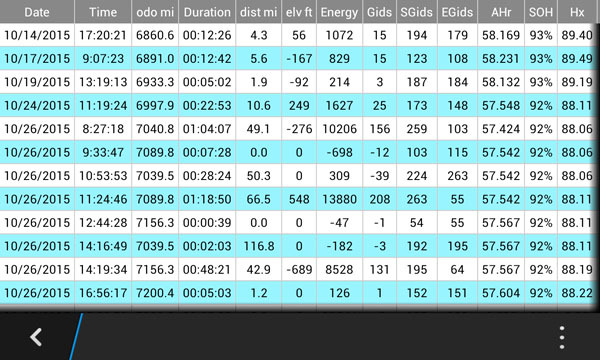 The app also registers the amount of regenerative braking. Down a long grade, the total power consumed is negative as the regenerative braking charges the traction battery. Again, the Leaf displays this as a series of dots to the left of the neutral position. 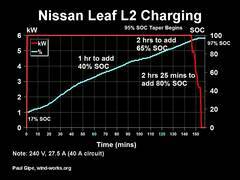 Leaf Spy reports regenerative braking in –kW. Leaf Spy reads the tire pressure monitors in each wheel. This is a useful feature for the base model Leaf, like ours, that doesn’t display tire pressure on the dash or central display. Monitoring tire pressure helps drivers “hypermile” by alerting them when pressure falls below that desired for optimum low rolling resistance. We’ve learned from others on the Nissan Leaf forum to keep the tires inflated above that typical. For example, we inflate the tires to 40 psi. As temperature drops during the winter, so does tire pressure. Leaf Spy tells us when this occurs. We can then inflate the tires back up to 40 psi. Temperature of the battery pack affects range. Temperatures below standard temperature detracts from range, higher temperatures add to range. High battery temperatures can damage the traction battery. As with other conditions, the Leaf’s dash displays relative temperature as a series of bars. 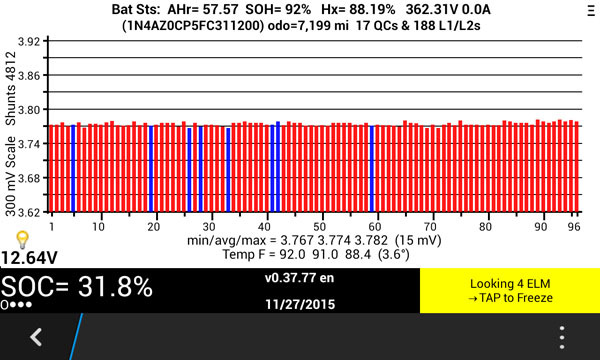 Leaf Spy gives us the temperature readings directly from the traction battery sensors. The first screen of the app displays cell voltages and a summary of statistics on the traction battery. This includes capacity of the battery in amp-hours, State of Health (SOH), pack voltage, the odometer reading, and the number of charging events. Amp-hours are a measure of battery health. It’s typically in the range of 60 amp-hours. With pack voltage of about 400 V, the pack has approximately 24 kWh (60 Ah x 400 V = 24 kWh). New cars will have about 292 Gids, 64 Ah, and a SOH of 99% to 100%. Another screen monitors charging power and SOC and the percentage of Gids. The app reports both the kW available to the car and the kW being delivered to the traction battery. The Leaf uses the car’s on-board charger when charging at a Level 2 station. 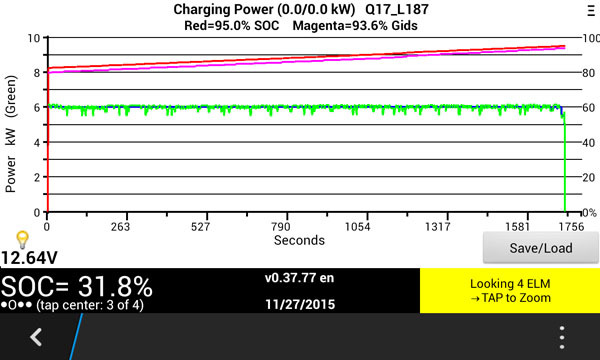 For our Leaf, the app will show 6.6 kW at the on-board charger and 6 kW after the charger. Thus, we can add 6 kWh per hour of charging on a L2 station at 240 volts and at least 27.5 amps. The app can save the charge history for later retrieval and analysis. For data geeks, Leaf Spy saves several of the data sets as *.csv files that you can open in your spreadsheet software. This includes a charging log, a GPS log, and a trip log. It also reports a summary table of each trip. 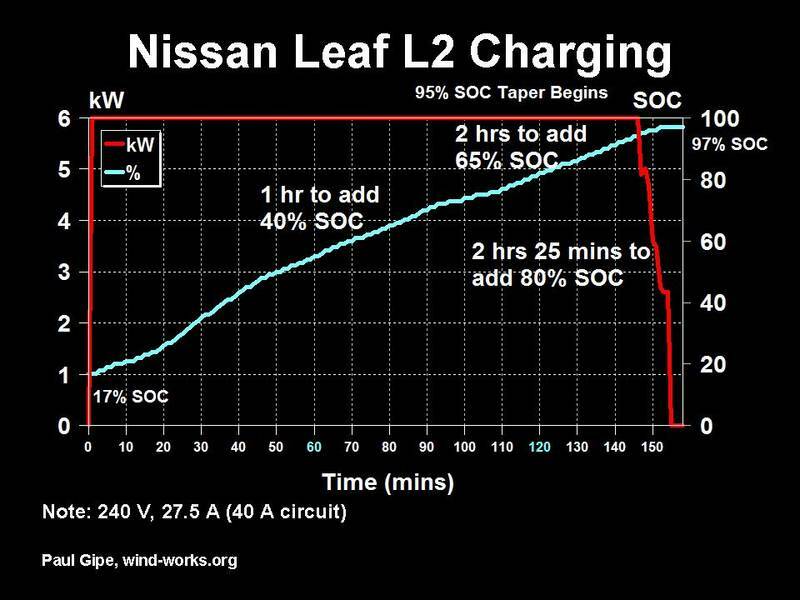 Because the data is now readily available from Leaf Spy, users are sharing data on the Nissan Leaf’s battery degradation with time and temperature. This discussion can be found on the mynissanleaf forum. 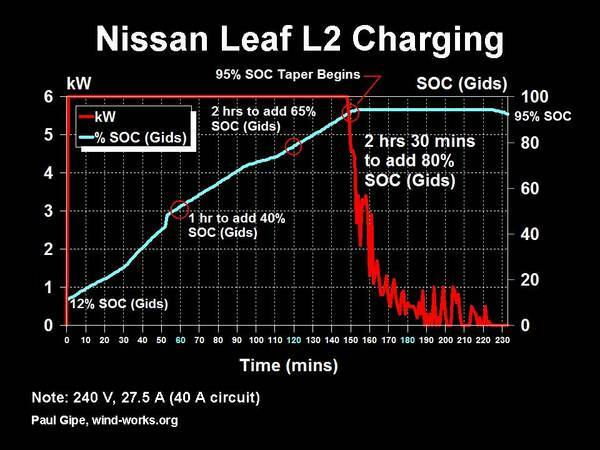 Leaf Spy is an inexpensive but invaluable tool for tracking the performance of a Nissan Leaf. For drivers who want to get the most out of their Leaf, Leaf Spy and especially Leaf Spy Pro is an easy-to-use, full-featured app that works seamlessly with smart phones running i-os, android os, and BlackBerry 10.2.